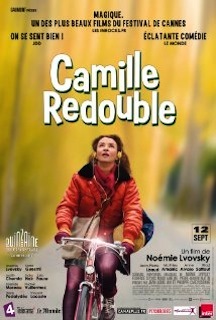 Review: Noémie Lvovsky wrote, directed and acted in “Camille Rewinds”, a light French comedy that carries a little charm without being properly original. Displaying apparent similarities with “Peggy Sue Got Married”, and attempting to invoke Rivette’s moody surrealism of “Celine and Julie Go Boating”, the film tells the story of Camille, an alcoholic 40-year-old actress in the verge of a life crisis, after a painful separation from her husband, the man she always has loved. In the New Year’s Eve, Camille falls drunk, to be bizarrely transported to her past, when she was 16. In an inexplicably way, she continues with a mature woman's appearance, even having to go to high school again. Regardless the enjoyable music of the 80’s, the plot lingers too much time on teenager episodes, and often drags in the revived moments of passionate love. Sometimes ludicrous, sometimes sober, “Camille Rewinds” counts with a competent execution but stumbles in a borrowed back-to-the-future tale that will not stick in my memory.